I’m really enjoying reading these posts…I did think of doing one on the teenage years, but then again, maybe you’re all better off in blissful ignorance of what might lie ahead! Haha you make a good point but still I would love to read your “ten random things” list! go on, go on, go on! They do know is right! I don’t know how they pick up on it but they just seem to know it will get a good reaction! The ‘I love you’ hugs really are the best. Though sometimes I think he’s already starting to manipulate me with them 😉 We’ve still got most of your list to look forward to – I’m taking notes! No. 2! No. 2! No. 2! Isn;t it amazing? I am always struck at how totally different my boys are. Sure, they share some similarities but on the whole, they are all hard-wired differently. Wonderful Wagon recently posted…A Week in Dinners. I know, I remember being pregnant on my third and wondering how we could possibly fit another character into the family as the two others seemed to have every trait covered between them… but I was completely wrong! Love it! Especially the infinite numbers of characters. I often think that when I look at my twins. They have had exactly the same..everything… from day one yet they are so completely different in every way! Love the list Naomi. I still remember the first bad word. He repeated it about 20 times and loved the sound of it. Luckily we weren’t in public at the time and he didn’t add it permanently to his vocabulary. Haha you were lucky Una … yes hopefully they grow to know not to use it, the four year old tried out a big bad word recently, in perfect context but luckily it has not been heard since! Great list Naomi, I think what has most amazed me is how the children become more wonderful with each year, if that is possible. 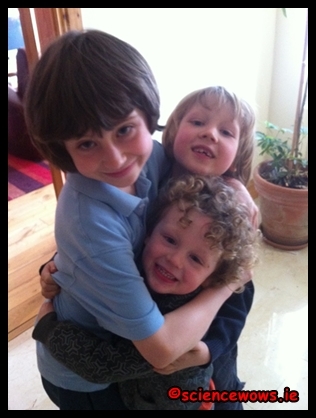 However, I am awaiting the day when they hit the teenage stage and it all reverts to chaos. brilliant balance of humor and honesty!! i love it! Thanks so much Louise, really glad you liked it! Ha ha-no 6!And a big awwww for no 10!Great list. Thanks for creating the linky Lucy, what a great idea!